The teaser of Velaiklaran features Sivakarthikeyan in a macho avatar. The much-loved Sivakarthikeyan has slowly but surely proved that he is one of the most talented young stars in Tamil cinema today. And now, he is all set to add another feather to his cap. In an exciting development, the official teaser of his eagerly-awaited ‘Velaikkaran’ has finally been released and it is simply mind blowing. 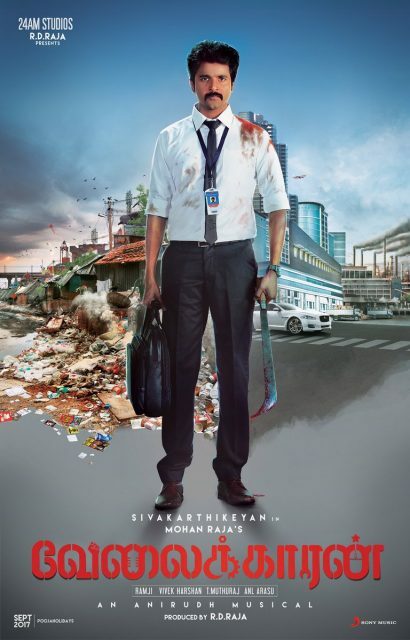 The nearly one-minute-long features Sivakarthikeyan in a macho new avatar and highlights the how the working man can become a force to be reckoned with. Featuring several gripping dialogues and action scenes, the teaser indicates that ‘Velaikkaran’ could be an absolute delight for fans and casual viewers alike. In case you did not know, ‘Velaikkaran’ is an action-thriller and has been directed by Mohan Raja. Besides Sivakarthikeyan, it also features Nayanthara and Fahadh Faasil in the lead. This is Mollywood star Fahadh’s first Tamil film and features him in a negative role. The supporting cast includes names such as RJ Balaji, Prakash Raj and Sneha. Interestingly, recently, Mohan Raja revealed that he had cast Fahadh Faasil in ‘Velaikkaran’ as he a terrific performer and can motivate his directors to do better. “Instead of creating the character and casting the actor, I wanted to rope in an actor who would inspire me to create such an antagonist. With Fahadh on board, I knew I had the best and my challenge was to give him a role that would feed off of his thirst as a performer. It motivated me to create something great and after watching the output, I believe I am on the right track,” he had added. Well, we hope that ‘Velaikkaran’ proves to be big winner at the box office and gives fans a reason to rejoice. All the best!